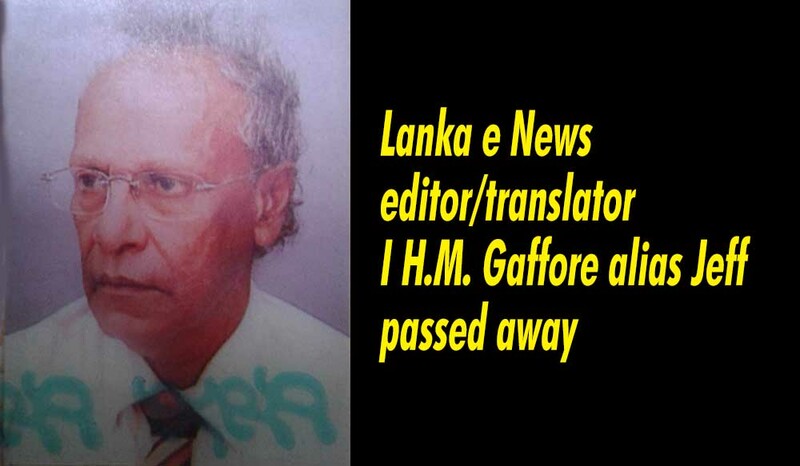 (Lanka e News - 22.Nov.2018, 8.00PM) I H.M Gaffore alias Jeff who was in charge of the English translation for Lanka e news for the past ten years, passed away on 20th November in Colombo. At the time when Lanka e news was oppressed during the Rajapaksa era, when everybody was leaving Lanka e news fear of threats, Mr. Gaffore tactfully evaded the situation, stood beside LEN and helped to bring a unique identity to the English edition of Lanka e News. He is a prolific writer, an outstanding translator and a great friend. he passed away on the 20th night. Although he had a degree in law he never practiced in courts. Before being a translator he was working in Bank of Ceylon for 15 years. The legal and the commercial knowledge he had helped to bring a prestige to the English edition of Lanka e News. Before the destruction of Lanka e News, when everybody was working together, we can remember the jokes he shared with his deep voice which helped our staff to be happy. The contribution he gave to carry the image of Lanka e news to the international and the truth disclosed by LEN to the English readers will be ever commemorated. His sudden death is unbearable to all of us at LEN. Gaffore was 73 years at the time of his death and a father of one daughter and three sons. Our beloved Gaffore the peace you wish and the blessings of Allah will always be with you..!